LONDON (Reuters) - Bats are living up to their frightening reputation in the world's worst Ebola outbreak as prime suspects for spreading the deadly virus to humans, but scientists believe they may also shed valuable light on fighting infection. 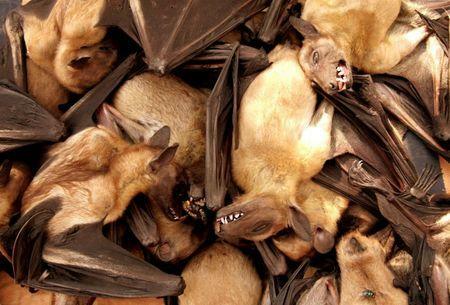 Bats can carry more than 100 different viruses, including Ebola, rabies and severe acute respiratory syndrome (SARS), without becoming sick themselves. While that makes them a fearsome reservoir of disease, especially in the forests of Africa where they migrate vast distances, it also opens the intriguing possibility that scientists might learn their trick in keeping killers like Ebola at bay. "If we can understand how they do it then that could lead to better ways to treat infections that are highly lethal in people and other mammals," said Olivier Restif, a researcher at the University of Cambridge in Britain. Clues are starting to emerge following gene analysis, which suggest bats' capacity to evade Ebola could be linked with their other stand-out ability -- the power of flight. Flying requires the bat metabolism to run at a very high rate, causing stress and potential cell damage, and experts think bats may have developed a mechanism to limit this damage by having parts of their immune system permanently switched on. The threat to humans from bats comes en route to the dinner plate. Bushmeat -- from bats to antelopes, squirrels, porcupines and monkeys -- has long held pride of place on menus in West and Central Africa. The danger of contracting Ebola lies in exposure to infected blood in the killing and preparation of animals. Scientists studying Ebola since its discovery in 1976 in Democratic Republic of Congo, then Zaire, have long suspected fruit bats as being the natural hosts, though the link to humans is sometimes indirect as fruit dropped by infected bats can easily be picked up by other species, spreading the virus to animals such as monkeys. This nexus of infection in wildlife leads to sporadic Ebola outbreaks following human contact with blood or other infected animal fluids. This no doubt happened in the current outbreak, although the scale of the crisis now gripping Liberia, Sierra Leone and Guinea, which has killed around 5,000 people, reflects subsequent public health failures. "What is happening now is a public health disaster rather than a problem of wildlife management," said Marcus Rowcliffe at the Zoological Society of London (ZSL), which runs London Zoo. Bats' role in spreading Ebola is probably a function both of their huge numbers, where they rank second only to rodents among mammals in the world, as well as their unusual immune system, according to Michelle Baker of the Commonwealth Scientific and Industrial Research Organisation, Australia's national science agency. Baker, who is intrigued by bats' ability to live in "equilibrium" with viruses, published a paper with colleagues in the journal Nature last year looking at bat genomes. They found an unexpected concentration of genes for repairing DNA damage, hinting at a link between flying and immunity. "(This) raises the interesting possibility that flight-induced adaptations have had inadvertent effects on bat immune function and possibly also life expectancy," they wrote. As well as tolerating viruses, bats are also amazingly long-lived. The tiny Brandt's bat, a resident of Europe and Asia, has been recorded living for more than 40 years, even though it is barely the size of a mouse. Bats also rarely get cancer. "We are just at the beginning," Baker said in a telephone interview. "But if we can understand how bats are dealing with these viruses and if we can redirect the immune system of other species to react in the same way, then that could be a potential therapeutic approach." It won't be easy. Turning on components of the immune system can bring its own health problems, but the idea -- which has yet to get beyond the basic research stage -- is to turn up certain elements to achieve a better balance. One reason why Ebola is so deadly to people is that the virus attacks the immune system and when the system finally comes back it goes into over-drive, causing extra damage. Ebola works in part by blocking interferon, an anti-virus molecule, which Baker has found to be "up-regulated", meaning it is found in higher levels, in bats. The bat immune system may or may not lead to new drugs one day. Still, experts argue there are plenty of other reasons to cherish bats, which also play a vital role in pollination and controlling insect pests. They are also a traditional source of protein in West Africa, often served in a spicy stew, and restrictions on bushmeat consumption are now contributing to food shortages in parts of West Africa, according to the International Food Policy Research Institute. Hunting and butchering bats may be risky but cooking is thought to make them safe. The World Health Organization advises animals should be handled with "gloves and other appropriate protective clothing" and meat should be "thoroughly cooked". "In the long run it would be sensible to see people moving away from hunting bats but in the short term they provide an important source of food," said Rowcliffe of ZSL. "Essentially, wild meat is a good, healthy product. People in Britain eat venison and rabbit, and in many ways it's no different to that."